Our garages and storage areas can get pretty cluttered with all of the stuff we end up needing to maintain our households. From basic gardening tools, mowers, holiday decorations, bicycles, some do not even have space in their garage for their car. Wouldn’t it be nice to have multiple tools wrapped up in one? If you have an air compressor already, you might notice that it seems like the pressure from the air compressor could help with pressure washing. Maybe there’s something you can do to combine your existing air compressor and the pressure washer you want. Can an air compressor become a pressure washer? We do not have a straightforward answer, instead, the answer is more like, “sort of.” It is possible for your air compressor to become a pressure washer with an attachment like this spray gun, which connects your garden hose and air compressor. But the results will not be the same. Your garden hose typically will produce 40-70 PSI. Most pressure washers will start at 1300 PSI, and can only go up from there. No matter the attachments or modifications you make on your air compressor, you’ll only get to about 100-200 PSI if you’re lucky That is still double the size of your standard hose and is really handy if you have a job that needs a little more power than your hose but does not need the power from a pressure washer. PSI is the pound per square inch that is exerted onto the surface, so it’s the measurement that says how strong the pressure is. The greater the PSI, the more it’ll likely spray off. You can also focus the stream to specific areas but moving it closer to the surface or by using different nozzles to make the stream more narrow. However, your option is really limited in you are going the air compressor/garden hose route. Get an electric or gas pressure washer if you have a really tough job beyond just day to day cleaning. Can you use a garden hose as a pressure washer? When using a standard garden hose for clean up jobs, you’ve definitely used the trick where you cover a piece of the opening with your thumb to create a jet of water. Or maybe you have a nozzle with several settings and one of them packs some heat with it. But is it possible to get a specific attachment to pressurize your garden hose? You may have already heard about the Turbo Jet Power Wash, which claims to turn your garden hose into a pressure washer. It does produce a more powerful jet stream. The consensus among reviewers is that it does not much better than the jet-setting on an adjustable hose nozzle. Your garden hose will likely never exceed 70-100 PSI, so pressure washers are still the better option. If you are going to turn to turn your air compressor/garden hose into a pressure washer, understand that the results will not be the same. But that doesn’t mean that it is useless. In between thorough pressure washings, your air compressor could help with maintenance pressure washing. The could also be true with a more delicate job. For instance, say the powered toy car that the kids like to ride around in. You want something to chip off chunks of dirt, but you do not want to harm the neat stickers. Air compressor as a pressure washer could help for such a job. If you are trying to save garage space and have them bulky equipment, you could consider a combination unit that is both a pressure washer and an air compressor. Combination units are generally electrically powered. Electric washers won’t give you the same pressure as a gas pressure washer. Although they do exist, they are also a little difficult to come by. The only unit we found on Amazon is currently unavailable as of Summer 2018. But do not fret, if you do not have a pressure washer or do not have space for one. There are other cleaning methods that you can use to take care of excessive build up. This one is not our favorite, but good ol’ fashioned elbow grease is sometimes adequate. While we may not want to do it, it can help to get down and dirty with a scrub brush and soap. But it is at least quieter than using a pressure washer or a garden hose trick, so you could wash your driveway at 2 am without waking the neighbors. The dirt and grime that pressure washers can push away with ease can still be cleaned by hand. For instance, oil on the driveway can be a pain to clean so we like to think that pressure washing is the easiest. You can sprinkle sawdust or kitty litter on the stain and let it sit for half a day. Then, sweep it up and discard it then spray your driveway with your garden hose. You can use dishwashing soap and hot water to clean up additional stains and dirt. To tackle that oil stain, even more, dip a deck brush into a hot water and soap mix and scrub away. Heat is proven to be a huge factor when it comes to cleaning. Even when you are washing by hand, it is almost always advisable to use hot water for the toughest stains. When a material that is stuck to a surface, using a heat gun and a scraping tool can help remove that material. Of course, this may be extremely tedious and your arms might hurt from it, but it is an option if you’re without a pressure washing. 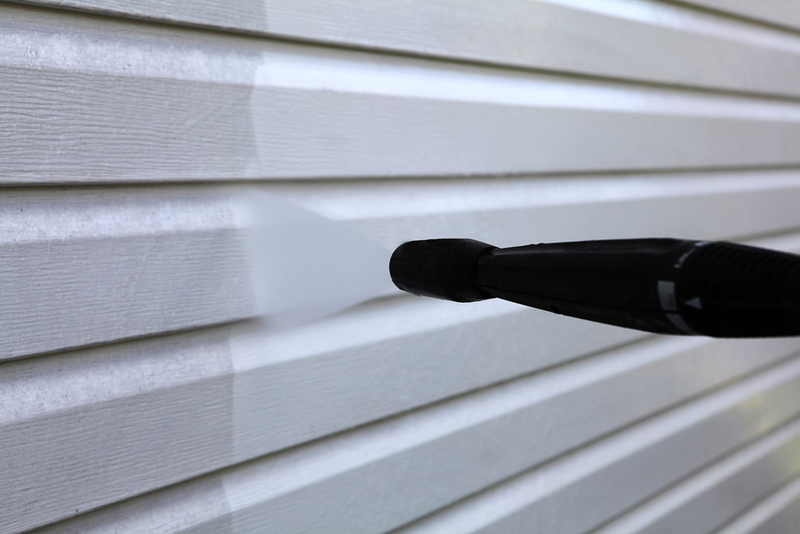 Soft washing is actually the preferred method over pressure washing depending on the job. For instance, many roofers discourage using a pressure wash on a roof since it could lead to irreversible damage. You can read more about pressure washers and roofs here. Soft washing relies on low water pressure, but a higher volume of water. Often times, you get a much more overall clean with soft washing. It is able to get into small sections that a pressure washer stream is not able to reach. The soap is able to spread out more to reach the little nook and crannies that can’t be scrubbed. Since you do not need a lot of pressure, you can usually soft wash using a standard garden hose. Many people also claim that soft washing is the better method overall. This is because plants will not be harmed by harsh pressure. You can also be a little more flexible with different soaps that you can use. Pressure washers need specific soaps in order to not be overly foamy. With soft washing, you can use almost any soap depending on the job and surface you are cleaning.